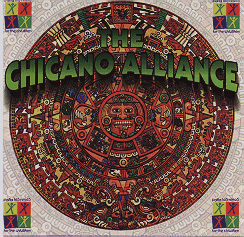 The Chicano Alliance "Para Los Ninos" CD, an important acknowledgement of the Chicano community and the Chicano music scene, is a commemorative two-disc CD collection that contains a variety of musical styles and artists. Proceeds will benefit The Chicano Alliance Network, Para Los Ninos, and The Quetzalcoatl Memorial Scholarship. Featured artists include: Tierra, Malo, Little Joe y La Familia, El Chicano, Rosie & The Originals, and many more. The Chicano Alliance Network, a national group promoting Mexican-American unity, supports and sponsors positive endeavors by Chicanos as they move into the American mainstream culture. Para Los Ninos, founded in 1980, is a nonprofit family support center designed to raise at-risk children out of poverty and into brighter futures through positive educational opportunities and support involving families and communities. The Quetzalcoatl Memorial Scholarship, the creation of KPCC 89.3 FM radio personality Daniel "Sancho" Castro, is a nonprofit foundation whose sole purpose is to further the educational achievement of the Chicano/Mexican-American community. Available in most major record stores.